Mosquitoes need water to reproduce. Some types of mosquitoes lay their eggs on water via a floating “raft” of multiple eggs. Other types of mosquitoes lay their eggs on soil or even clogged humus-laden rain gutters, and the eggs hatch when water rises after a rain. Since mosquitoes can travel long distances, they can’t be completely eliminated round your home. Pest Solutions 365 offers a barrier spray treatment to reduce and control the mosquito population around your home or office. Our licensed technician will utilize a natural-based, EPA-approved solution to treat all the known areas where mosquitoes harbor around the outside of the home, such as foliage, shrubs, trees and grass. Each service will control mosquitoes for 14-21 days. Treat areas where water collects with a product that is designed to prevent hatched mosquitoes from developing into adult mosquitoes. The larvae are stopped in their tracks at that level and never mature. Treat areas where mosquitoes rest. These include areas under foliage near houses and vertical surfaces. 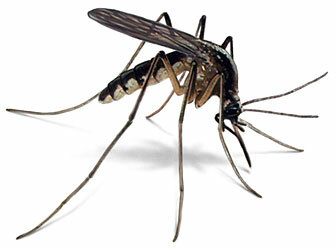 This controls the mosquito by making the area where they rest inhospitable.